The IStar developed community, Naples Reserve, won big at the recent event, garnering top honors in several prestigious categories. 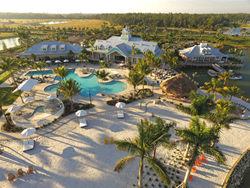 Naples Reserve’s development team engaged Cotton & Company, an industry leading real estate marketing firm, last year in conjunction with the grand opening of its new Island Club amenity center. The firm’s challenge was to position the community as a fun-filled, tropical destination. Together, the team executed the comprehensive program to introduce the market to the “Casually Awesome” lifestyle of Naples Reserve. Created amongst 22 lakes and sweeping open water views, the community emphasizes lakefront living with Southern Coastal-inspired homes and amenities along the water’s edge. Lakes provide prime opportunities for kayaking, canoeing, paddleboarding and scenic vistas. The community’s centerpiece, 125-acre Eagle Lake features a large tiki hut on destination Kontiki Island and also offers a mile-long stretch of lakefront nestled against the Picayune Strand State Forest, a 76,000-acre state park with protected pinelands, cypress swamps, marshes and abundant wildlife. Naples Reserve offers 16 fully decorated models available for viewing in six of 11 planned neighborhoods built by Southwest Florida’s premier homebuilders, including Ashton Woods, D.R. Horton, Florida Lifestyle Homes, KTS Homes, Lundstrom Development, Marvin Development, McGarvey Custom Homes and Stock Signature Homes. Homes are priced from the high-$200s to more than $1 million. Naples Reserve is located at 14885 Naples Reserve Circle in Naples. Naples Reserve is located off U.S. 41, 2 miles southeast of the Collier Boulevard/CR 951 intersection and 10 minutes from I-75, Exit 101. Call 239-732-1414 or visit http://www.NaplesReserve.com. iStar (NYSE: STAR) finances, invests in and develops real estate and real estate related projects as part of its fully integrated investment platform. Building on over two decades of experience and more than $35 billion of transactions, iStar brings uncommon capabilities and new ways of thinking to commercial real estate and adapts its investment strategy to changing market conditions. The company is structured as a real estate investment trust, with a diversified portfolio focused on larger assets located in major metropolitan markets. Additional information on iStar is available on its website at http://www.istar.com. Cotton & Company is an industry leader in the field of real estate marketing. Over the past four decades, the innovative firm has marketed more than 1,700 communities stretching from Panama to Poland. The firm is headquartered on Florida’s east coast with an in-house team of more than 30 professionals. The Cotton Solution integrates today’s most innovative digital strategies with award-winning creative, strategic thinking and unmatched industry expertise to drive sales results for its clients. For more information, visit TheCottonSolution.com or call 772-287-6612.